The first step in getting setup in the Logicbroker portal involves setting up your products for inventory transmission to your channel/retailer. Not all retailers/channels are capable of receiving inventory feeds. It is best to always check with your partner to verify their requirements. To setup your products you can follow the automated walk through by clicking the link or following the steps below. Select your partner you plan to setup products for. This is done to prevent sending products that are not setup in the Channel/Retailer's system. In this way, the process is separated so that any new products available to be updated via Inventory feed will need to be setup using this matching file first. This will allow you to send all products in your inventory updates and only products that will update are ones that have been setup previously. Now that you have set up your products, you can begin updating the inventory and other attributes for those items. Begin by downloading the Standard Feed under the Download Files section. You can download CSV or XLSX. For all the products listed in that file, you can begin adding attributes such as Quantity, Description, Cost etc. For more details on all the field attributes and the standard, see the Inventory Specification under the Document Standards section. When uploading the new file make sure Standard Feed is selected. If you have a customer inventory CSV or XLSX mapped to our standard you can use the Supplier Feed. To learn more about setting up a custom CSV or XLSX format contact support. Once your feed is uploaded, we validate the format for that partner. We only check to verify all proper fields are populated for the partner selected, we do not do any validation to verify the SKUs match in the partner's system. After the processing is complete you will see an audit log of all inventory uploaded attempts under Events. Here you can view all transmissions and review any errors from failed submissions. Based on the partner you are integrating with Logicbroker will send the inventory update on a periodic basis. This differs between channels/retailers, but typically will send at least once every 24 hours. The inventory feed will only send updated products from the last transmission to the retailer. For example, if you had 100 products setup, and sent 2 feeds, one updating 25 and 50 in the other; the next update sent to your partner will show 75 products in the inventory update. If you send multiple feeds before the update is transmitted to your partner, and only want to include information from the last feed, you can enable Latest Feed Only under feed settings. For more information on other settings available on the Inventory Feeds page see information below. Under the Feed Settings section there are a few things you can setup to help you process files. This will allow you to clear your inventory after the selected time. We allow periods of 7, 30 and 60 days. This will remove all your items based on the period selected requiring you to setup new items after all items have cleared. This should always be used to maintain an up to date list of products. If you are sending the same inventory counts across all your partners, you can setup an allocation percentage under each partner. If you select 50%, and submit an inventory count for an item of 20, the update sent to your partner will be 10. This allocation will be done by for all products within the inventory feed. 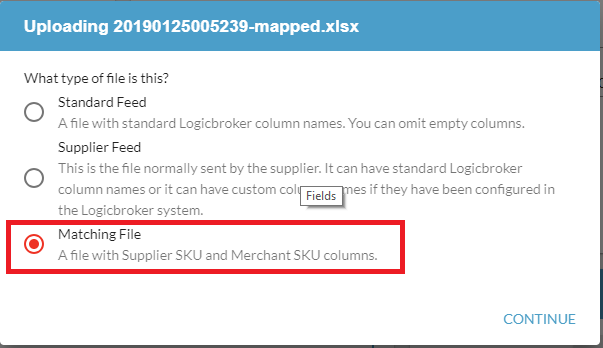 This will allow you to submit all inventory feeds using your standard feed and any products not matched will automatically get created with the MerchantSKU matching the SupplierSKU provided. This should be used in cases where the MerchantSKU is the same as the SupplierSKU, it is not required to provide the MerchantSKU or provided in another field. The MerchantSKU can only be set to a different value then the SupplierSKU through the matching file. When submitting inventory feeds, all updates depend on matching the SupplierSKU. If you do not want your SupplierSKUs to match when the case doesn't match, then select this option. If this option is checked and items are sent that aren't matched they will not show up in the unmatched items report in the Download Files section. If you send multiple feeds before an update is transmitted to your partner, and only want to include information from the last feed select this option. For example, if you send 2 feeds, one with 20 items and another with 10, the update sent to your partner will only include the 10 with this option selected. Selecting this will remove all item information setup for your partner. Selecting this will remove the MerchantSKU for all items setup. All other information will be retained and will allow you to setup new MerchantSKUs on those items. Use this if incorrect MerchantSKUs were setup on your items, but you want to retain all other item information already setup. This is the format your partner has setup, this can be a custom CSV or XLSX template, but typically will be the same as the Standard Feed. This is the standard inventory specification containing all available item attributes. For more information on these attributes see the Inventory Specification page. This will contain all items that were sent in your inventory updates that did not have a matching SupplierSKU. If Auto match is setup, no unmatched items will appear in this list.